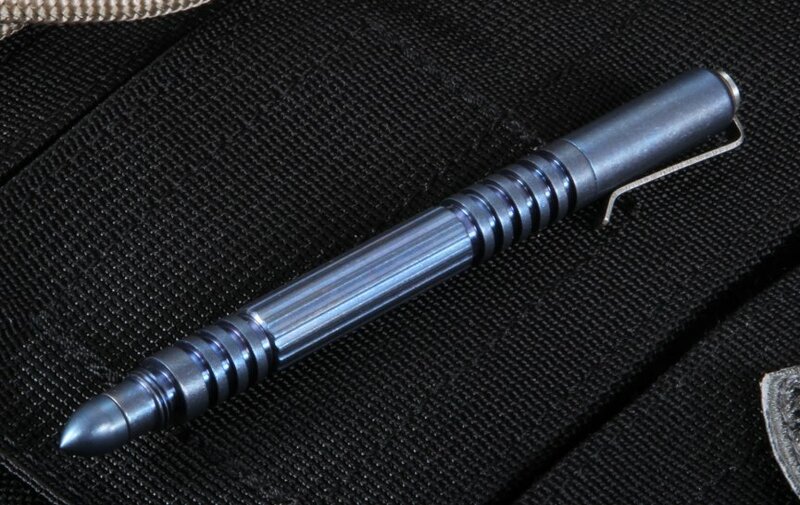 Compact and dependable Hinderer Investigator pen in blue anodized titanium. If you are looking for an extremely tough, reliable, high quality American Made tactical pen in a discrete size then the Hinderer Investigator pen is for you. 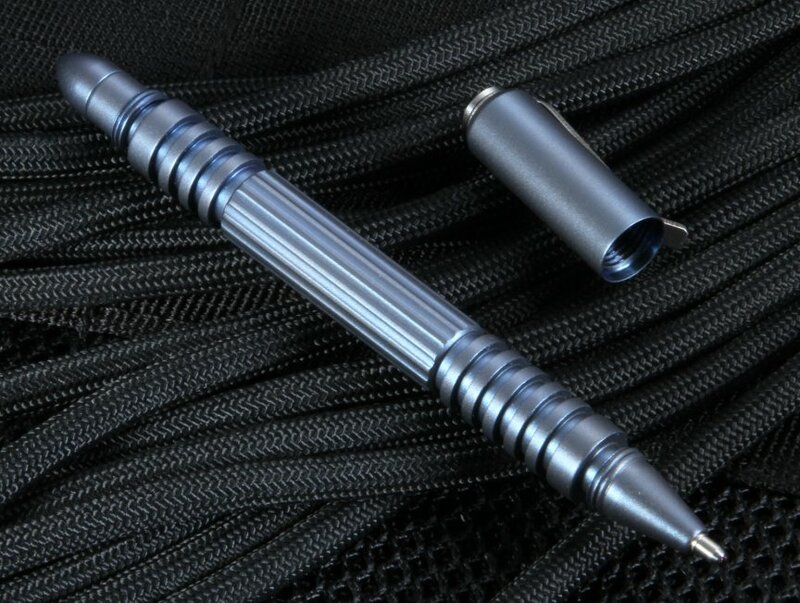 The pen body and cap are solid titanium. Well-placed grooves on the body of the pen provide excellent grip. 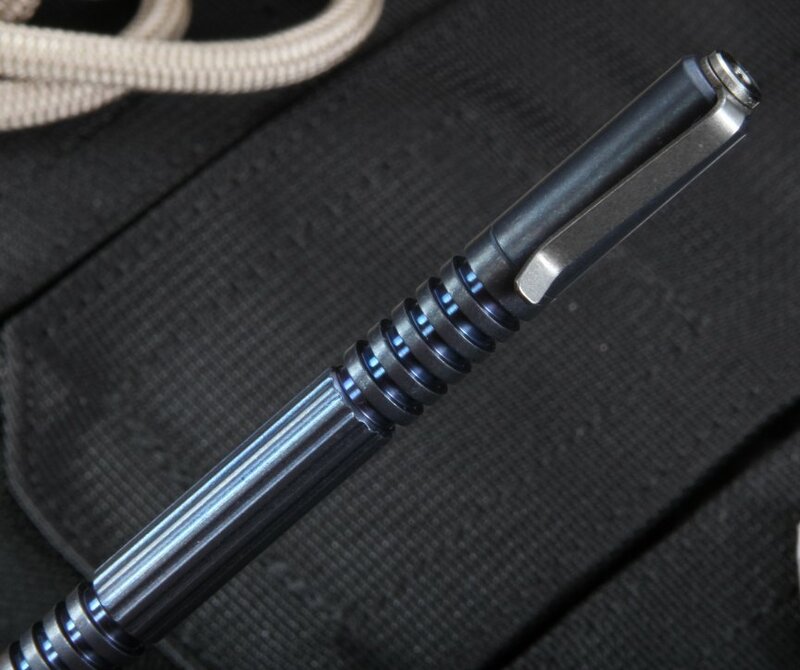 Cap can be mounted on both ends of the pen. Bullet shaped strike tip is titanium as well. 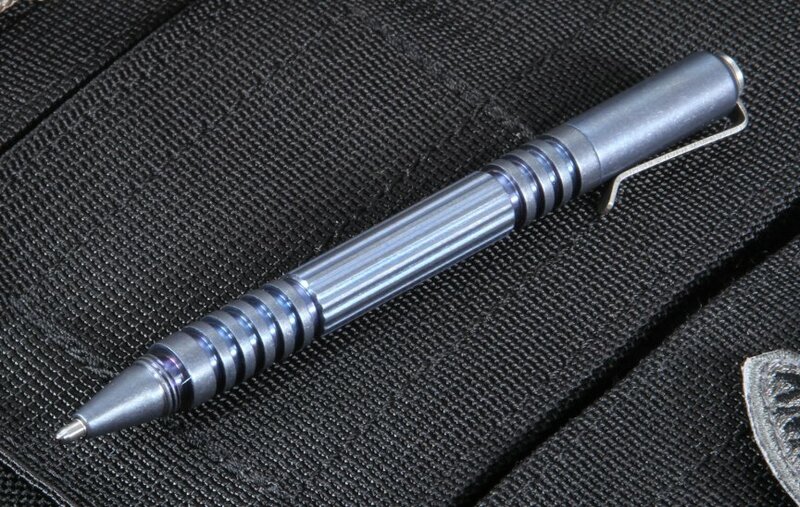 The Investigator Pen by Hinderer Knives is made in the U.S.A. I love everything about this pen. 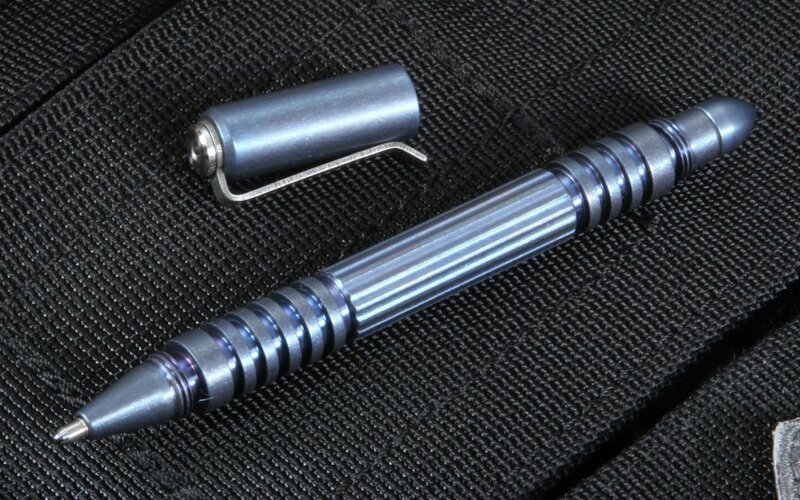 I nearly ruled it out due to the small size, but kept coming back to it as it is one of the few pens that has modular components available (I like that I can get a flat end to bring the pen through TSA and use in meetings without it looking like a weapon) and the cap screws into both ends. I went to the length of cutting down a Bic pen to the same size and using it for a few days before becoming convinced the investigator is really a great size. I now like it much better than traditional sized pens. The weight is also very nice. I thought it would be too light, but it has more heft than you would think. My scale put it at 0.85 oz. with ink cartridge. Anyway, it feels nice in the hand and not at all noticeable in the pocket. The Fisher cartridge is very nice. Smooth, and no worries about leaking. The machined grooves are very grippy. If they feel too "sharp" or rough, I've heard of people putting #47 O rings in the grooves. They don't bother me, and the blue in the grooves is so beautiful, I haven't done that. The machining is perfect. The clip is a little small, but quite stiff and I have no fear it will fall out of my pocket. The color on mine is less vibrant than shows in the pictures under most lighting. Under fluorescents, it is pretty close to the pictures. Under candescent lighting at night, it looks more grayish blue, except for the grooves, which are always vibrant blue. It wasn't what I was expecting, but I absolutely love it. 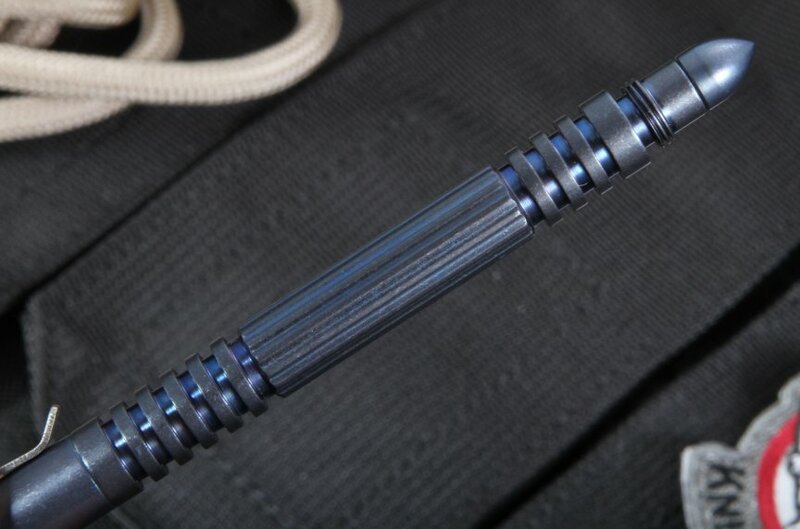 So much so that I'm about to put down another $200 to get the Ti Bronze Anodized version so I can have one with black ink and one with blue. This is an incredibly well-made item! Proof of the machining is everywhere, but be sure to check the hole through the clip end where you can attach a lanyard if you like- mine had a small piece of titanium still in it blocking the "view" until I cleared it (simple push). Buy it- you will not be disappointed.